That costs us more than a billion dollars a year in tax money, 5.9% of the state budget. That's up from $133.26 million in 1983, increased by more than a factor of seven. 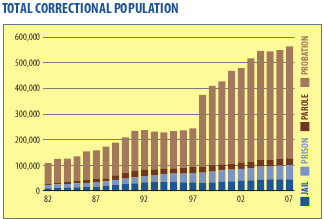 Meanwhile, the correctional population swelled from around 100,000 in 1982 to more than 550,000 in 2007. 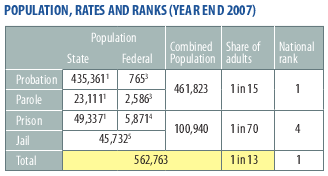 And while other states have started decreasing their prison populations, Georgia's continues to increase. The state is even coming up with new ways to lock people up, such as kicking them out of mental institutions. We seem headed back towards plantation slave labor and prison road gangs in for minor drug infractions. How about we reverse this trend? It's time to call off the global drug war that locks up more than half of U.S. prisoners even by official prison statistics, while many current or former law enforcement officers say "as much as 80% of all felony crime is caused by drug addiction prohibition." It's time to legalize, regulate, and tax. 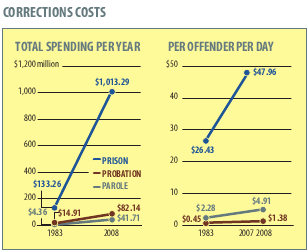 Meanwhile, we don't need a private prison in Lowndes County, Georgia. Let's use those tax dollars for rehabilitation and education.